Tonner Doll Company published new and groundbreaking website (http://www.tonnerdoll.com), built by digital geniuses 33Delivered, and touted to be the new hub for All Things Tonner. This new hub is not only a brand new way to shop, but also includes a social setting for the Tonner community. 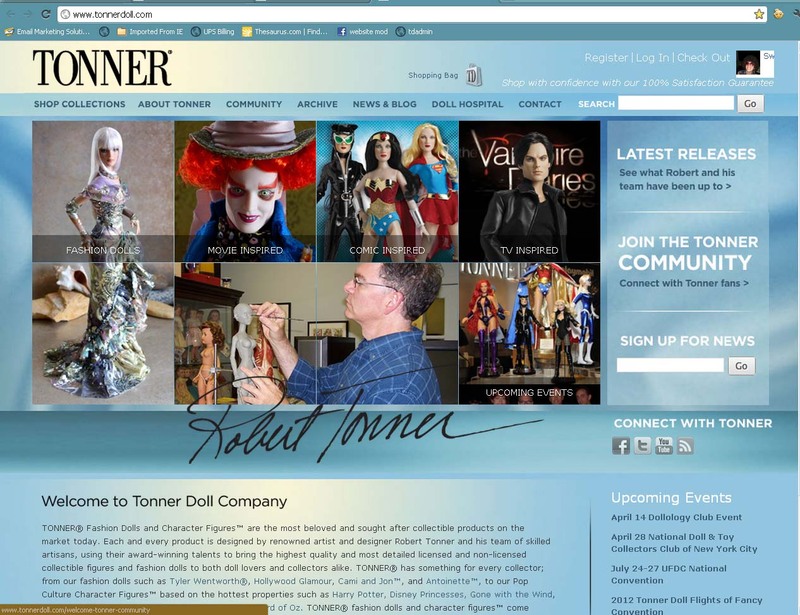 The award-winning Tonner Doll Company, Inc recently launched their brand new website, http://www.tonnerdoll.com. Established in 1991, Tonner Doll Company is internationally renowned and has been a staple in the high-end collectible doll industry for over two decades. The new tonnerdoll.com creates a fresh and new social layer for the Tonner community, and has been touted as the new hub for All Things Tonner. This added layer of fun includes highly-engaging social facets like Fan Submissions, where collectors and fans alike share doll photography, Fan Reviews, FOR fans BY fans, a Community page where Tonner news is announced and shared, and the latest updates from Tonner’s many elements of social media: Tonner Doll’s Blog, YouTube channel, Facebook, and Twitter. Another highly-anticipated component of Tonner’s new site is the Archive, which is currently a work in progress. This is quite a bold and brazen task, as 20+ years of dolls is much to chronicle. Fans and collectors are beyond excited at the prospect of being able to look back to reference almost any past Tonner doll. When complete, it will be an amazing resource for Tonner collectors and retailers everywhere. 33Delivered, the masterminds behind the cutting-edge new site, specialize in customized digital strategy and implementation, and are located at the 721 Media Center in Kingston, NY. Visit the new website at http://www.tonnerdoll.com, and come to shop, share, or play! About Tonner: Headquartered in Kingston, New York, the Tonner Doll Company, Inc. develops and markets high quality collectible dolls like Betsy McCall®, Effanbee® Dolls, and the ever-popular lines of dolls and fashions such as Tyler Wentworth®, Antoinette™ and Cami & Jon™, as well as other licensed characters, including PIRATES OF THE CARRIBBEAN, MARVEL UNIVERSE, THE WIZARD OF OZ dolls, and HARRY POTTER™ and DC STARS Super Hero Character Figures inspired by DC COMICS.